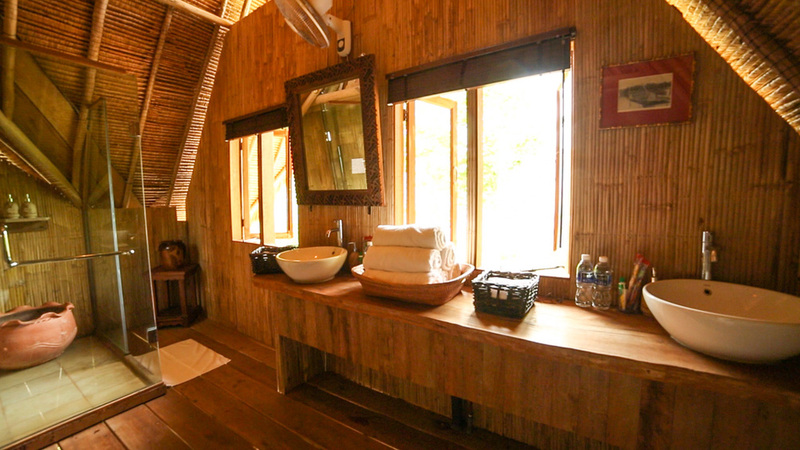 Guests stay in our Driftwood Palaces constructed using logs salvaged from the sea and the surrounding islands. There are nine Palaces, none of them are more than five paces from the beach. The Palaces are all elevated from the ground and are openly constructed to take advantage of the tropical breezes and stunning views. They are sufficiently far apart and cleverly designed to ensure complete privacy. They all feature at least one, large four-poster bed. The four-posters have a small fan and reading lamps inside, enclosed within a mosquito netting for maximum convenience. They have roof-mounted fans and they all have their own adjacent bathrooms. For large groups, there are at least 6 additional single beds which can be moved around as well as extra mattresses. Numerous hammocks and a few tents add additional flexibility. The Palaces described below are also shown on the map of the island, so you can work out how everybody can fit in. The Main House is the main dining area and bar. Tucked high into this structure is a room with 1 king-size four-poster bed. It has a terrific balcony view and is perfect for singles or couples who are musically inclined as it is right above the bar and sound system. This Driftwood Palace is adjacent to the Main House. It has 1 king-size four-poster bed and a small adjacent room suitable for an adult or a cot for a small child.. This Palace and the Main House share a bathroom past the BBQ area. These are four large, identical, Driftwood Palaces. Each has 2 king-size four-poster beds. A couple of these Palaces have wooden benches which, with a mattress and linen, are perfect as extra accommodation. Additionally, they can all house one or two more single beds. Each of these Palaces has an adjacent bathroom. There is a king-size four-poster bed in the Tree House which is suitable for an adventurous couple or kids. 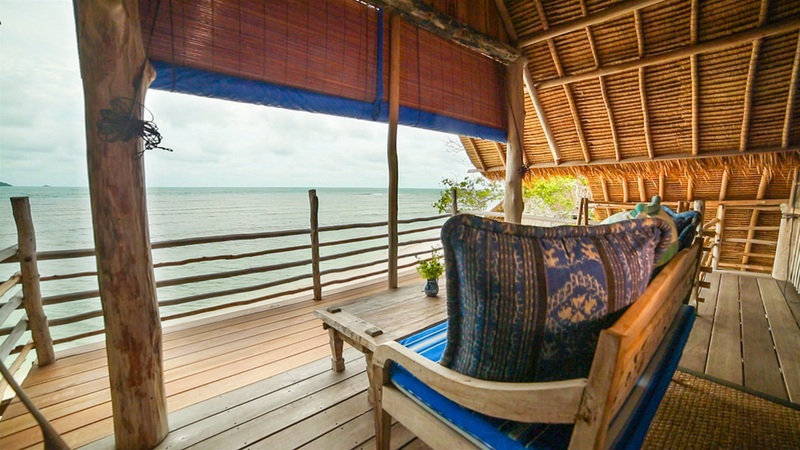 The Tree House may have limited space, but offers unlimited breathtaking view of the seas. 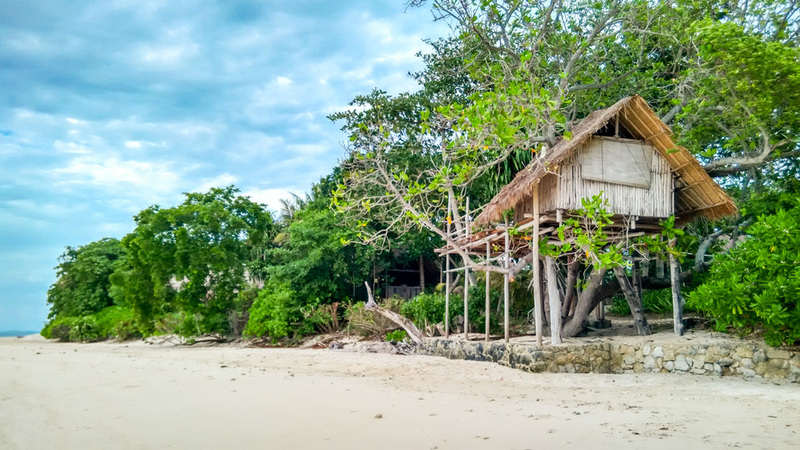 This is a giant Driftwood Palace with a king-size four-poster bed and two double Balinese beds. It has an en-suite bathroom on the same level. Adjacent to The Big House, Merifield Palace is the newest and the largest Driftwood Palace in the island. 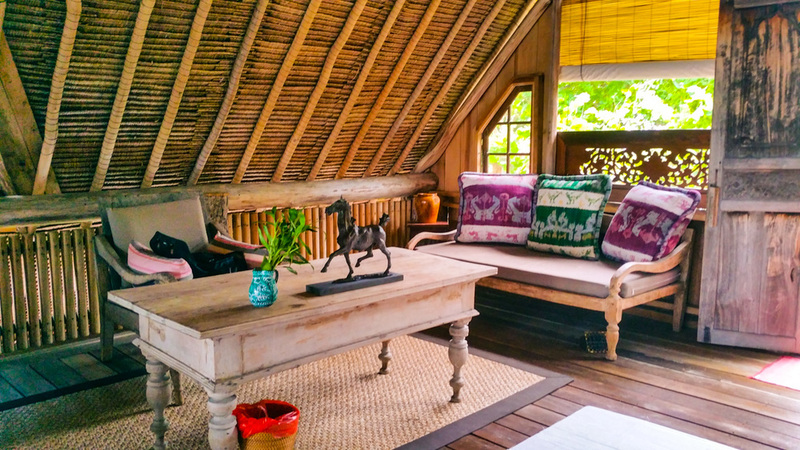 There are 2 four-poster beds, 2 Balinese bamboo beds, and 2 bathrooms inside. The Pool House is a lovely structure overlooking the pool, good for a romantic full moon experience. It currently has one king-size four-poster bed. It is a little more ‘open’ than the other Palaces and is normally used for massages during the day. It can however be easily turned into an additional accommodation, complete with blinds and mosquito nets for the double bed. There are at least 18 movable, single beds which can be placed in the Driftwood Palaces. It is suggested that these are placed in the Big House or Palaces 2, 3, 4 or 5. Some guests choose to sleep in the hammocks of which there are at least half-a-dozen. All the double beds have high-quality mosquito nets. The single beds can also be rigged up with nets. A couple of mosquito coils at either end of the single beds and a dab of DEET-based repellent behind the ears usually does the trick. We have four cute cots with mosquito netting for infants. We have had as many as 60 adults sleep in the island. Please note that if you are bringing maids to look after your kids, you’ll have to fit them into one or more of the accommodation options above. The group organizer usually assigns the accommodation. Our staff members are happy to set up the Palaces under your instruction. For large groups (say more than 15 or 20 adults & kids), you may want to email us the suggested sleeping arrangements in advance. Linens, towels and basic toiletries are provided.